Under the Piano: Impress her, him, or yourself with a rare gift at a rare price. When you give the gift of an Under the Piano session to yourself or another, you can feel secure in knowing that you have stepped outside the banal and predictable and given an experience to be remembered forever and unlike any had before. 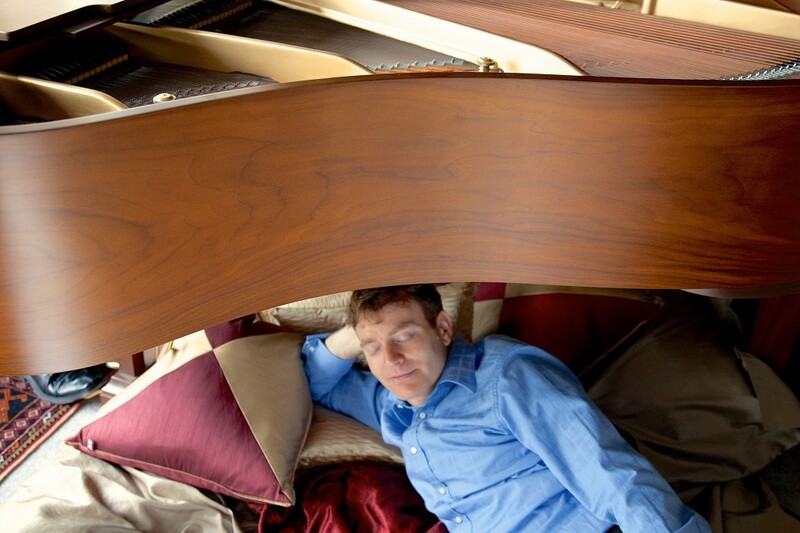 Yes, the advantage of lying under a piano, is that you will experience music in a way you never have before and in a way that impacts you unexpectedly and wonderfully. You will have impressed yourself or the lucky gift recipient with your brilliance at making such a choice for a present. This is what happens when you lounge in a “cocoon of pillows and blankets underneath a grand piano, surrounded by candles and lovely scents” and then listen to a a series of improvised pieces literally composed just for you in the moment. This offer expires on Wednesday, October 1 at midnight. The offer is two Under the Piano sessions for the price of one. I know Halloween is not even here, but here is a rare opportunity to have one or two magical and truly unique Christmas or Birthday gifts in the bag now. This offer is only available to the first 3 people who grab it or for the 1 person who wants all 6 available certificates. Purchase one Under the Piano certificate and get a second one of equal value at no additional cost. The certificates can be for your personal use or one or all can be a great gift for friends and family. The second certificate will be an exact match for the first. If you’ve experienced Under the Piano before, you know what you’re getting. If not, here’s another wonderful description that gives a glimpse into this amazing experience. My husband & I were treated to a truly unique, private concert for our anniversary. We lounged in a cocoon of pillows and blankets underneath a baby grand, surrounded by candles and lovely scents. Craig Addy improvised (!!!!) a series of lovely, soulful, meditative, never-played-before music that you can literally FEEL all over; the vibrations enfold and lift with the crescendos, and gently floats you down with the softer parts… and lasts long after the last note fades from hearing. I wish I could be Under the Piano every day, if only for a few minutes, to be totally immersed in life-affirming music and emerge both calmed and energized. At least I have the MP3s (also available as CD) to remind me of this amazing treat. A magical experience — I recommend this as a PERFECT gift for anyone who loves music, needs a spiritual pick-up, loves unique experiences, or “already has everything”. Listen to a track from Angela’s session. Remember, this offer expires on Wednesday, October 1 at midnight. Call me at 604-662-3053 to purchase your certificates or if you have any questions. A customized certificate will be emailed to you upon receipt of payment. This offer is exclusive and not applicable in conjunction with any other special offers or discounts.